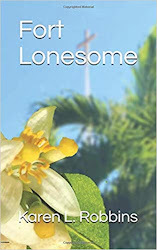 Just north of Sydney are the Blue Mountains with beautiful vistas and vie ws of mountain cliffs and valleys and plateaus. 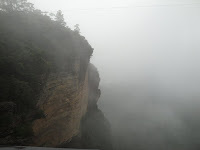 Unfortunately like most mountainous areas, they are subject to weather systems and we arrived by City Rail from Sydney to find that a weather system had moved in causing light drizzle and misty clouds that moved through the valleys and up the mountainsides. A little disappointed but undaunted, we set out on the Blue Mountain Explorer Bus. and heard from our driver that it was a good day for looking at things up close. 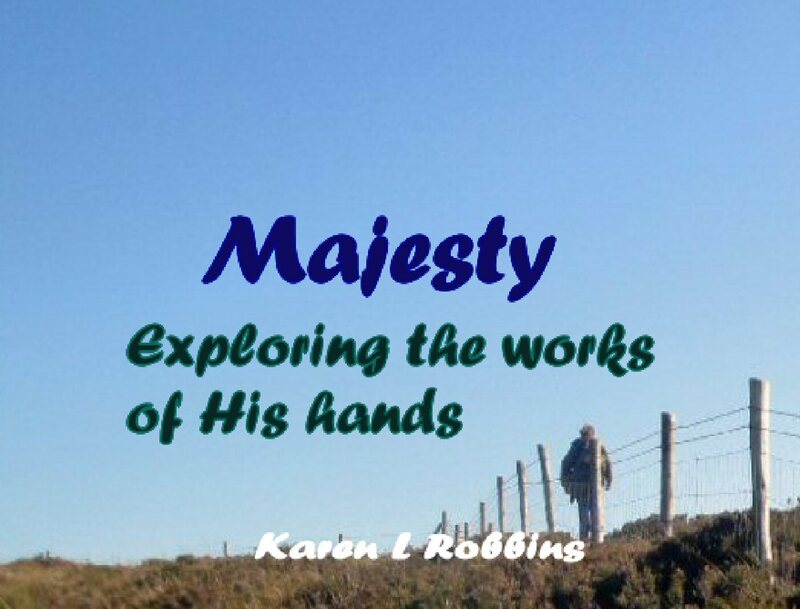 His suggestion was to walk the trails and enjoy the waterfalls, the forest and the birds that inhabit them. 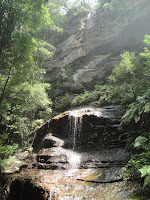 We set out on his recommendation and found some stunning waterfalls that cascaded over ledges, a forest that was mysterious with the mist that hung in between the firs and eucalyptus trees, several cockatoos and a pair of kookaburras. 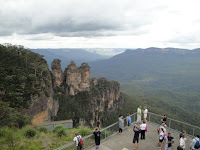 By the time we were done with our “walkabout” the valley had cleared a bit and we were able to enjoy the views from the lookouts taking in the famous Three Sisters formation. 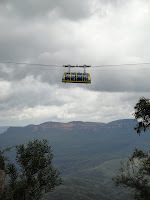 We stopped by Scenic World but passed on the cable rides and railway which we had done the last time we were here. Back on the bus, we hopped off at Leura, described as a vintage town, i t was basically a shopping opportunity but a nice little walk up a tree-lined street lined by boutiques and restaurants. We didn’t seek out the teapot collection said to be in the thousands. Neither of us was eager to explore teapots.